You Hopped, You Shopped and You Adopted! This past weekend, the 7th Annual Hop Around the Shops event brought together local Southport Corridor merchants and dogs from Chicago animal shelters for a day of deals, discounts, shopping and adopting. The last few years I've watched Hop Around the Shops from inside our boutique; helping customers draw eggs filled with candy and discounts from our Easter basket and greeting the adoptable dog stationed outside. But this year, I was the one in charge of the whole thing, and my perspective changed quite a bit! Adding "Event Planner" to my resume was an exciting and new venture for me as Director of Outreach at Dogaholics. 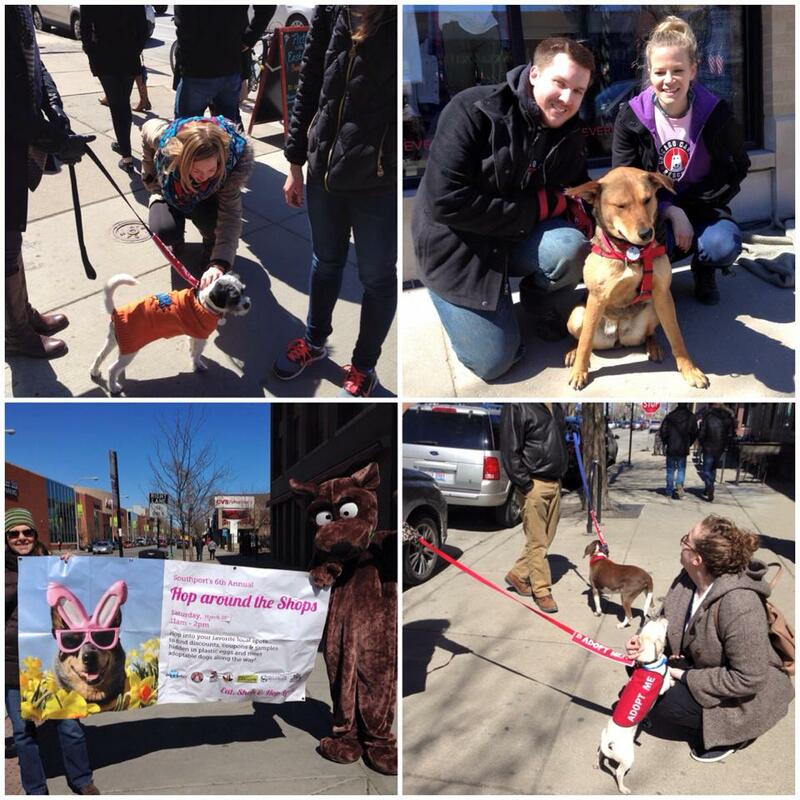 Hop Around the Shops was my first large-scale event and it was definitely a fun way to kick-off Spring in Lakeview. Coordinating 28 businesses, 30+ dogs from four different shelters and directing all the required volunteers was no easy feat but it sure was a rewarding one! Seeing the community come together for such a good cause is how I know what we do is important. When business owners and managers would come in to Dogaholics asking who their dog would be, we'd look up the dog's photo on the shelter's website and there was always a squeal of joy over the cutie that would be at their store soon. I know there were a few employees that thought about taking their hosted dog home with them that day! Just watching the leaders from the various shelters chatting together and bonding over their passion of animal rescue was warming to me. You start to realize that the day was more than just getting these dogs out of the shelter for a day - it was about showing the community that shelter pets are just as loving, cute and eager to be your new family member. It was about how volunteering for a day or fostering a dog for a week is just as crucial to the success of finding these animals their furever homes. Most of all, I think it's about the connection that dogs have with us and how their very presence makes us smile and brings us all together. The event itself was a huge success and even though final adoption numbers are still coming in, I know that a few of the dogs were adopted on the spot! Plus, several applications were turned in in hopes of adopting others. There was definitely an increase in interest this year and I know there were lots of people who are on their way to pet parenthood! Thank you to everyone who was involved with Hop Around the Shops this year and I'm looking forward to making next year's event even bigger and better! To see more photos from the day, visit our Facebook! Older PostTo Be a Better Human....Get a Dog!